The DuraFon PRO is a long-range, expandable cordless phone system that is compatible with existing PBX or IP-PBX phone systems. For companies or organizations that require a much longer range communication solution than what Wi-Fi phones or DECT phones can deliver, DuraFon PRO is an ideal solution and one that doesn’t come with the recurring expense from a telephony carrier or service provider. 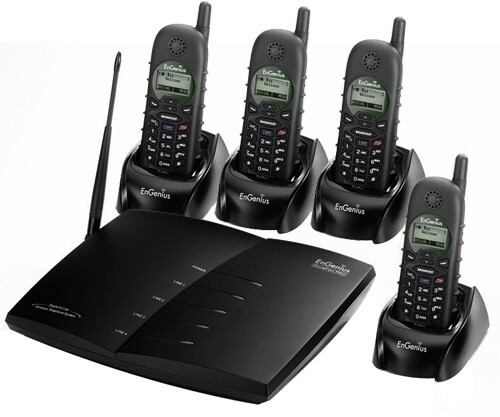 The DuraFon PRO long-range cordless phone system is ideal for business and organizations with employees who conduct work on larger properties outside of a conventional office like large resort properties, schools, colleges and universities, sports arenas or stadiums, golf courses, warehouses, high-rise hotels, expansive agricultural properties, industrial plants, oil and gas fields, convention centers, amusement parks, and other venues where employees need to stay in constant contact with a main office or management team and where Wi-Fi or DECT phones can’t reach. The system is a complementary addition to virtually any existing telecommunications platform because it can plug right into an existing PBX or IP-PBX phone system. Companies and organizations can start with a simple single base station and purchase additional handsets and then buy additional base stations and handsets as they need them. The DuraFon PRO system also support ruggedized DuraWalkies for 2-Way Radio communication over the same long-range distances that PRO handsets are capable even without an intervening base station.